Still pinching myself. There are buds on our rose bushes. We never had roses before so we feel all grown-up here, especially since we haven't killed any yet. My cold climate friends, you need some roses to remind you Spring is right around the corner. How about a rosy tutorial instead? Remember the Seriously Fun Quilt tutorial here? 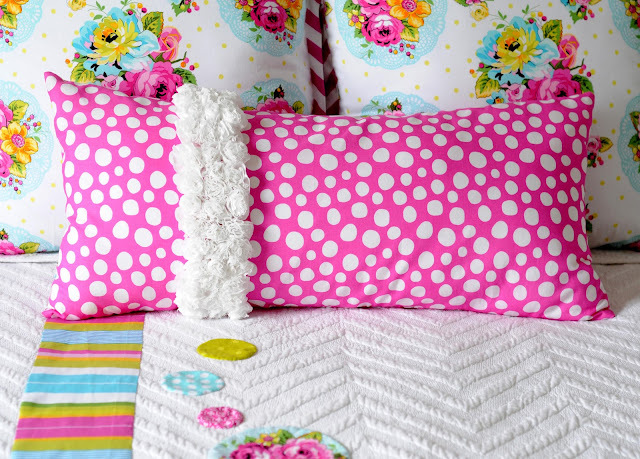 Well, here's how I made the pillow on the quilt. A note of possible interest: I decided on the white solid fabric for the roses partly because both sides of the fabric are the same color, whereas a printed fabric will have a noticeable right side and wrong side. The roses will have a raw edge, which will cause some loose threads. 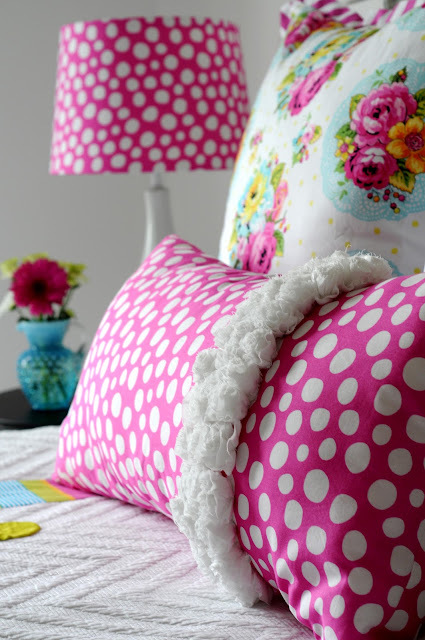 Don’t be concerned; once the pillow is complete and you trim all the loose threads, you’ll see that the lacy, delicate roses are quite appealing. 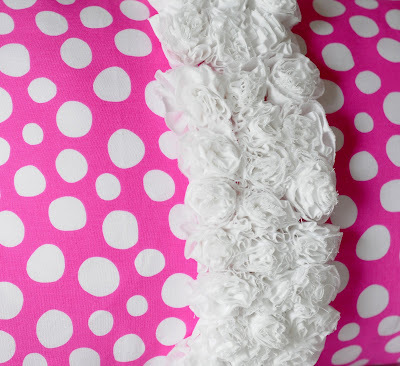 1 Ready-made pillow inserts come in several sizes, but it’s easy to make your own custom-sized inserts. First, take the two muslin panels and place them right sides together; pin together. Stitch a ½” seam around the panels, leaving an 8” to 10” opening in the center of one side and making sure to backstitch both the beginning stitches and the end stitches. 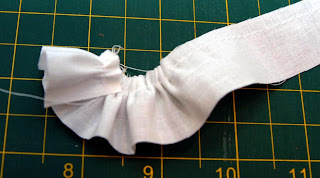 Clip the loose threads and turn the muslin form right side out. Firmly stuff the form with the fiberfill. Fold under the ½” seam allowance and hand stitch closed. 2 Lay the front panel of the pillow out on your work surface. Use a ruler to measure in 10” from either the left edge of the panel (or right edge, if you prefer). Use your marking utensil to lightly draw a straight line from the top of the panel to the bottom in from either the left or right. This will be your center guide when you begin attaching your roses. Set aside. 3 I used 44"-45" wide quilt weight fabric for the roses. 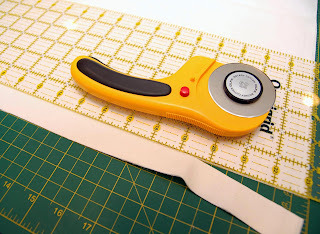 Keep the fabric folded in half along the natural fold line as you lay the fabric down on your cutting mat, which will give you two strips per cut. Measure and cut 1” strips through both layers of fabric. Cut 20 strips, and then cut those strips in half along the fold line. You will end up with 40 strips. You might need more or less depending on how tight you gather the flowers and how closely you place them, but that’s a good estimate. 4 Using a basting stitch (a wide stitch) on the sewing machine, sew a ¼” seam down one side of each strip making sure to leave at least 3” of thread on both ends of the strips and DO NOT backstitch. Gather the strips by pulling gently on one of the long threads on the left, then one of the long threads on the right until you have about 7” of a gathered strip. Continue this process. 5 Take one of the long pieces of thread from the gathered ruffle, use it to thread a needle, and start rolling the gathered fabric on the same end as the threaded needle. As you roll the fabric, stitch all the way through the layers at the basted seam line. 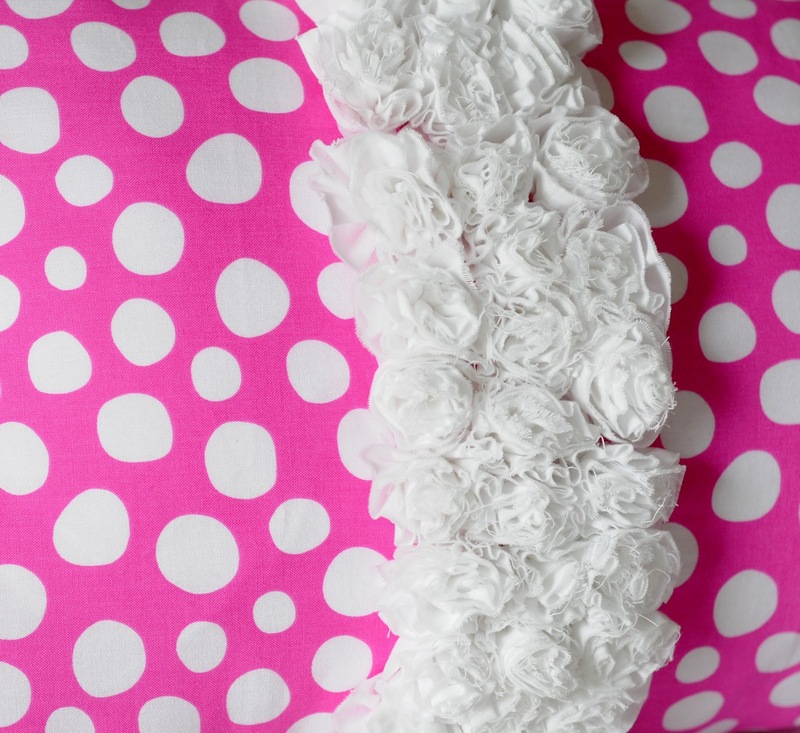 6 Keep rolling and stitching until you come to the other end of the ruffle. Knot the thread at the end to secure the finished flower. Continue this process with the remaining ruffles and make a stack of roses as you watch your favorite movie or listen to a musical. 7 Lay the front panel of the pillow down on your workspace right side up. Place a flower 1” down from the top edge of the fabric over the center of the line you previously made. 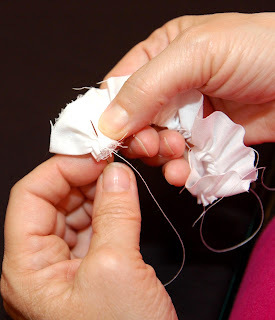 Sew the flower in place from the back of the panel through to the bottom of the flower. 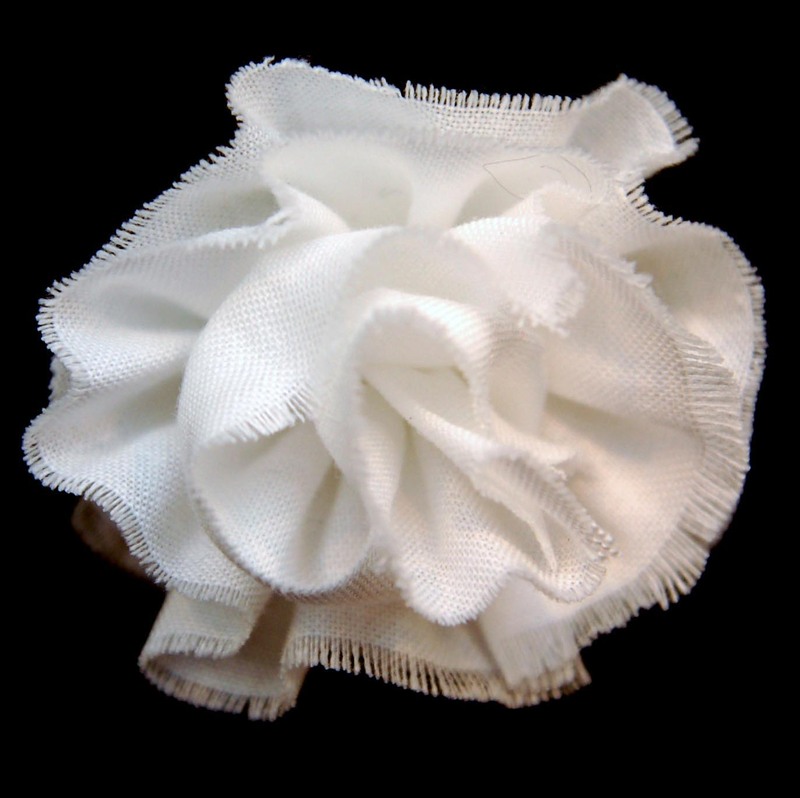 Once the first flower is sewn in place secure with a knot and sew another flower closely to the left and right of the center flower. Move one row down and continue the process of securing each flower, using the centerline as the guide. Make a total of 3 rows close together across and three rows down until you get to the bottom of the panel, leaving 1” of panel fabric free at the bottom. 8 Complete the three rows of flowers down the front of the pillow panel, then place the back panel of the pillow fabric over the front panel, right sides together. Pin right sides together making sure the flowers will be out of the way of the seams. Sew a 1/2 “ seam leaving an 8’-10” opening at the bottom length of the pillow, making sure to backstitch both at the beginning and end of your stitches. 9 Insert the pillow form. Once the pillow form is in place if the corners still need to be filled out just stuff extra fiberfill directly into the four corners of the pillow. Turn the open seams at the bottom of the quilt under and blind stitch closed. 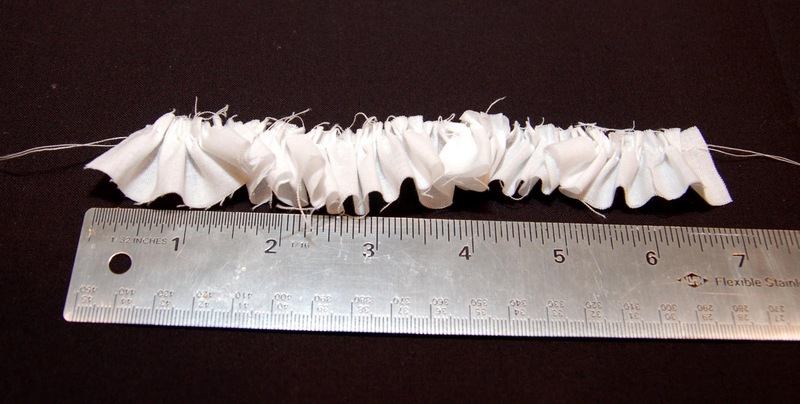 10 Pull and trim off loose threads from the roses. On to other newsy things; I am having oral surgery as you are reading this. Three implants, plus some other things I shouldn't discuss if you're eating, or even if you aren't. Hoping I'll be up and about before you know it.